A Scot has launched a High Court fight against extradition to the US for allegedly carrying out the "biggest military computer hack of all time". 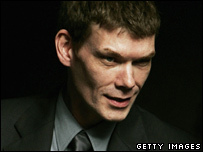 Glasgow-born Gary McKinnon, 41, is accused of gaining access to 97 US military and Nasa computers. Home Secretary John Reid granted the US request to extradite him for trial. At the High Court in London, his lawyers argued he had been subjected to "improper threats" and the move would breach his human rights. Edmund Lawson QC, told two judges that, if extradited, Mr McKinnon would face the prospect of an unknown length of time in pre-trial detention, with no likelihood of bail. If found guilty, he would then face a very long prison sentence "in the region of 45 years, if not more", said Mr Lawson. There was also the prospect that he would not be allowed to be repatriated to serve part of that sentence at home in the UK. Mr Lawson said the US authorities had made threats during the plea bargaining attempt in 2003 which infringed his family and private life rights under Article Eight of the European Convention on Human Rights. Mr McKinnon has never denied that he accessed the computer networks of a wide number of US military institutions between February 2001 and March 2002. He was arrested in November 2002. He has always maintained that he was motivated by curiosity and that he only managed to get into the networks because of lax security.